Well we are hitting mid-winter here in New Zealand and it was a very chilly start to the day this morning. I think winter days at work should be made shorter so it allows some extra time to stay warm indoors and of course, what a better way to use that free time and scrapbook .... wishful thinking, right? This is a combination of Prima Papers and Tim Holtz stamps. 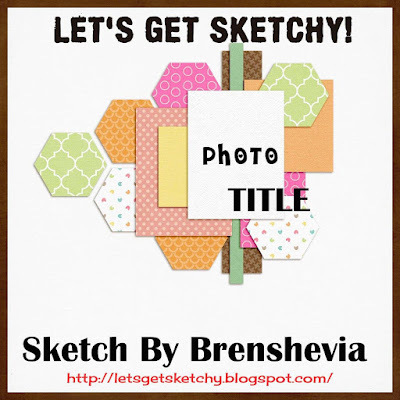 I have created the back ground hexagonal shapes with stamps and black archival ink. The title is a chippie, which I have inked in black and finished off with Glossy accents. I have added a few ink blots to the kraft cardstock. 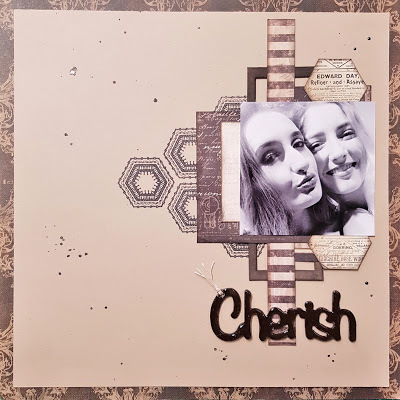 This photo is of my daughter and one of her lovely friends, and they have a lot of fun together - hence the "cherish" for those special moments. Would love to see your creations up on the Let's Get Sketchy blog using the 15 June sketch!